Perfect for the young man back from his first deer hunt or after getting his first buck, this hunting ornament celebrates a portion of the passage into manhood. Personalize with your hunter's name and the year, as well as with a custom sentiment that celebrates his accomplishment. 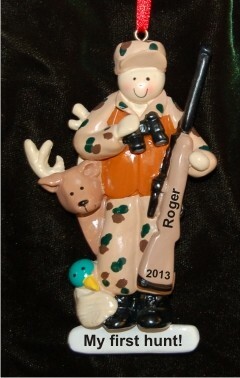 The My First Deer Hunting ornament measures 4.2"H, and arrives nestled in our black velvet pouch. Ornament for grandson Dec 1, 2017 Char T.
Christmas gift Jan 4, 2016 janet s.